About Minnkota Power Cooperative, Inc.
Minnkota Power Cooperative has a wide range of knowledgeable and skilled employees who work to bring reliable, low-cost electric energy to rural America. Our workforce consists of power plant personnel, engineers, electricians, line workers, technicians, accountants and many other positions needed to manage our unique business. Corporate headquarters for Minnkota are located in Grand Forks, N.D. The primary source for electric generation is the Milton R. Young Station, a power plant located 35 miles northwest of Bismarck, N.D. In total, Minnkota employs approximately 384 people. For the last 75 years, Minnkota has played a major role in bring a better quality of life to the residents of eastern North Dakota and northwestern Minnesota. Minnkota provides wholesale electric energy to 11 member distribution cooperatives. These co-ops, in turn, serve more than 128,000 retail consumers, including many of the region’s homes, farms, schools and businesses. When you work at Minnkota, you know you have an important job in an industry that will last. Minnkota makes career growth and development a priority by creating a challenging and rewarding work environment. Minnkota also promotes a true work-life balance that helps enhance the quality of life for its employees. 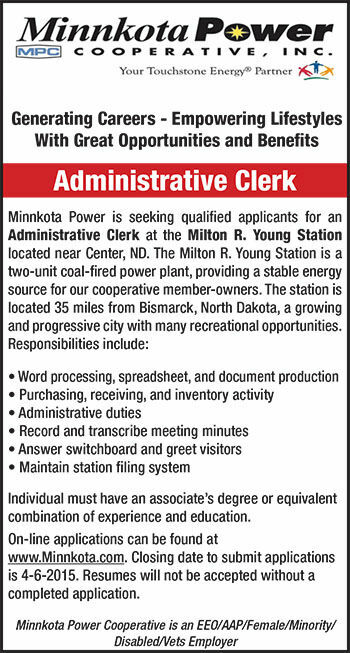 Minnkota Power is seeking qualified candidates for temporary summer positions located at the Milton R. Young Station located near Center, ND. The Milton R. Young Station is a two-unit coal-fired power plant, providing a stable energy source for our cooperative member-owners. The station is located 35 miles from Bismarck, North Dakota, a growing and progressive city with many recreational opportunities. Wage would be $14-15 per hour. Mow and trim grass around plant and designated lake areas. Garbage pickup around the lake. Perform annual physical inventory of spare parts. Cleaning and paining of warehouse facilities. Assist warehouse personnel during vacation periods. Individual must have a minimum of a two year technical education or equivalent experience in right of way. This person should be knowledgeable about farming. He/she should also be knowledgeable about real estate appraising. Also have a good working knowledge of engineering and real estate law as these relate to right of way work for an electric utility. Must have the ability to communicate well in negotiations. Engineering, negotiation, real estate law, and appraisal knowledge can be obtained through course work at the university and through courses offered through the International Right‑of‑Way Association. Individual must have a minimum of a two year technical education in electrical technology or equivalent and must be able to successfully pass a Personnel Risk Assessment. Applicable experience includes 3 years as a PSO or 1 year as a PSO Engineer. Must possess or be able to obtain NERC certification as a Reliability Coordinator. On-line applications can be found at www.Minnkota.com. Closing date to submit applications is April 3, 2015. Resumes will not be accepted without a completed application. Individual must have an associate’s degree or equivalent combination of experience and education. On-line applications can be found at www.Minnkota.com. Closing date to submit applications is 4-6-2015. Resumes will not be accepted without a completed application. If you’re looking for a career that offers great pay, benefits, advancement opportunities and a sense of pride, we invite you to visit www.minnkota.com and click on the Employment tab.